Jacoby Brissett out warming up. Jeff Driskell not. This is bad news for a lot of people: Will Muschamp, Charlie Weis, Driskel, Brissett and Verne Lundquist, who is likely to fall asleep by halftime of what is sure to be an absolute blowout. It looks like the true freshman will be replacing the other true freshman against the second ridiculously scary defense the Gators have had to face in as many weeks. 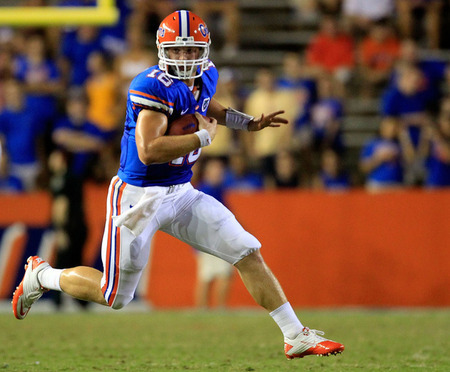 Driskel replaced John Brantley last week against Alabama after the Tide knocked him out of the game. Now Driskel seems questionable at best leaving Brissett as the next option. A kid who has never played a down of college football, taking his first snap in the Bayou against the nation’s No. 1 team. Good luck with that. LSU isn’t literally an NFL defense like you may hear often today. That’s hyperbole. But will most all of the players Brissett sees today one day be in the NFL? Yes. And he’s going to see a lot of them, mostly charging through his offensive line while frothing at the mouth. If I was Florida offensive coordinator Charlie Weis, I’d think of getting the ball out of Brissett’s hands as quickly as possible, just to protect your future investment. Although that might leave Chris Rainey and Jeff Demps open to certain injury, and you don’t want to lose them. Maybe take a knee on every down and just punt? This literally may be Florida’s best option. The Seminoles are having a hell of a time trying to run the ball (they’re 115th in the nation in rushing offense) and injuries are starting to mount for FSU. Meanwhile, Wake Forest has won three straight games for the first time since 2007 and quarterback Tanner Price is off to the best four-game start in school history (1,119 yards). The ‘Noles are just 2-5 against the spread in their last seven road games against the Demon Deacons, while the underdog is 6-1 ATS in the last seven meetings between these two teams. It’s going to be a long day for freshman quarterback Jeff Driskel, who is subbing for the injured Jeff Brantley in Baton Rouge today. LSU is allowing just 12.8 points per game and is coming off a game in which it allowed just 155 total yards in a win over Kentucky. The Gators are just 2-6-1 against the spread versus a team with a winning record and 1-4 ATS in their last five October games. I doubt LSU will roll but I don’t envision Florida scoring more than 10 points. I’m choking on chalk this weekend but I don’t care. Vanderbilt is heading in the right direction under first-year coach James Franklin but very little is going to slow down this ‘Bama team from making a run at the national championship. The Tide are 15-1 all-time against Vanderbilt at Bryant-Denny Stadium and is outscoring opponents 45-8 in the fourth quarter this season. Nick Saban’s team doesn’t let up and even though this is a huge point spread, I like ‘Bama to produce a blowout for homecoming week in Tuscaloosa. Oddsmakers keep jacking up the point spread on Stanford and the Cardinal keeps covering. Thus, there’s no reason to hop off the Andrew Luck bandwagon now. Stanford is 6-0-1 against the number in their last seven conference games and 12-3-1 ATS in their last 16 games overall. Meanwhile, the Buffs are just 1-4 ATS in their last five conference games and 0-5 ATS in their last five games as a road underdog of 10.5 points or greater. Check out College Football Point Spreads at Bullz-Eye.com. After a strong start I’m heading right downhill, which is good considering I’ve named this column “Fade Material.” After all, I don’t want to be made out to be a liar. The Wolfpack have looked horrible at times this season, but if they could just cut down on the turnovers they could stop sabotaging themselves. The underdog is 6-1 against the spread in the last seven meetings between these two teams and I’m a sucker for home dogs. Georgia Tech is 4-0 on the year and has covered in every game thus far, but the Jackets are due to suffer a scare. The Cyclones don’t blow you away statistically but this is a decent Iowa State team this year. Not only are they 3-0 thus far, but they also covered the spread outright as underdogs to Iowa and Connecticut the last two weeks. Can they make it three wins in a row as a dog? I’m doubtful, but I like them to cover the spread against a Texas team that’s 0-5 in its last five conference games. The game of the week is in the SEC as the Gators host the Crimson Tide in the “Swamp.” In 58 games as head coach at Alabama, Nick Saban has allowed less than 300 yards of total offense 33 times and the Tide have held opponents to 10 points or less 26 times during that span. Florida has been explosive offensively at times this year but I think Alabama’s defense puts the clamps down in the second half. The Crimson Tide are 7-1-1 against the number in their last nine games against the Gators and 4-1 ATS in their last five games overall. The underdog is 5-1 against the spread in the last six meetings between these two teams while the Irish are 1-5 against the number in their last six games as a road favorite. Meanwhile, Purdue is 3-1-1 against the spread in its last five games as a home dog and 9-3-1 ATS in its last 13 games as an underdog of 10.5 points or greater. The games between these two teams tend to be tight, so I like the Boilermakers to keep the score within 10 points.